January 31, 2019 – Patients who were moved between hospitals before receiving endovascular therapy were more likely to experience adverse clinical outcomes. Endovascular therapy (EVT) presents a good chance of saving stroke patients’ lives, but because the treatment is not available at every hospital, many patients must transfer hospitals before they can receive this chance. New research published today in Circulation indicates that stroke patients who undergo interhospital transfer experience longer delays before receiving endovascular therapy and have worse outcomes. 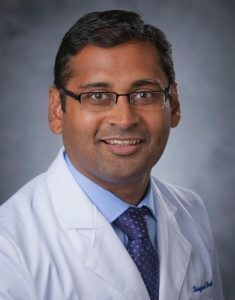 The article, authored by the DCRI’s Shreyansh Shah, MD, (pictured) and Ying Xian, MD, PhD, examined data from the American Heart Association’s Get With the Guidelines-Stroke registry, which includes ischemic stroke patients from more than 2,000 hospitals across the U.S. The team found that while EVT can be effective, interhospital transfers can have consequences. Patients who transferred hospitals were more likely to develop symptomatic intracranial hemorrhage (7.0 percent versus 5.7 percent). They were also less likely to be able walk independently at discharge (33.1 percent versus 37.1 percent) or to be discharged to home (24.3 percent versus 29.1 percent). These differences in outcomes could be at least partially attributed to longer wait times that transfer-in patients experience, said Shah, who recently received a “Stroke Care in Emergency Medicine” award from the American Heart Association and the American Stroke Association. The study examined the time from last known well to EVT initiation and found that transfer patients had a significantly longer wait time (median 289 minutes) than patients who arrived at a hospital that offers EVT (median 213 minutes). However, the transfer-in patients were more likely to have a door to EVT initiation time of less than 90 minutes upon arriving at the EVT-offering hospital (65.6 percent versus 23.6 percent). Shah said the team’s findings will be of assistance as hospitals collaborate to create stroke systems of care. To avoid interhospital transfers and combat the risk of worsened outcomes, the authors of the manuscript have several recommendations. Firstly, EMS professionals need to receive more education and training so that they can accurately determine when a patient is having a stroke potentially caused by a large vessel occlusion, meaning that EVT could be beneficial. Regulatory changes would also help because they would allow EMS professionals to take these patients to the nearest hospital that offers EVT rather than requiring patients to be transported to the nearest hospital. Another potential solution is to increase the number of hospitals that can provide EVT by creating mobile teams of specialists that are not based in a specific location. For example, Shah said, Duke has a team that moves between Duke University Hospital in Durham and Duke Raleigh Hospital, which enables Wake County stroke patients to receive treatment at their local hospital rather than be transferred to Durham. In addition to policy and organizational changes, Xian said, it is important to continue to educate the public about symptoms of a stroke so patients will know to seek help before they miss the window for treatment. The American Stroke Association uses the acronym FAST—Face (changes in expression), Arm (difficulty moving or grasping), Speech (slurring of words), and Time (Call 911 as soon as possible).